CAE's true fidelity simulation software based on original equipment manufacturer (OEM) from Embraer and vendor data. CAE's renowned Level D certified simulation models, including the Embraer Phenom 300 Simulator. 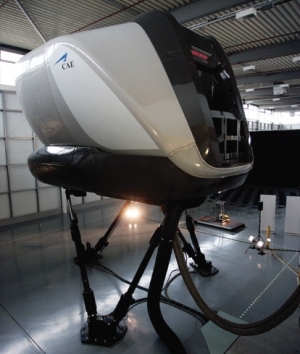 The CAE 5000 Series Embraer Phenom 300 simulator exceeds Federal Aviation Administration (FAA) and Joint Aviation Authorities (JAA) as well as additional international Level D qualification requirements and will also meet respective training task requirements detailed in international operations and licensing documents. Ergonomically designed exterior and interior, including a roomy Instructor Operator Station (IOS) and Non Simulated Area (NSA), based on extensive human factors analysis. Latest generation CAE Tropos-6000™ system employing commercial-off-the-shelf (COTS) graphics processors and a lightweight, high-resolution Liquid Crystal on Silicon (LCoS) projector. The CAE 5000 Series is also available for the Embraer Phenom 100 Simulator. Above information from Embraer and CAE. Above Embraer Phenom 300 Simulator - CAE 5000 Series from CAE's 5000 Series Brochure. Copyright CAE. Actual cockpit or synthetic fiberglass cockpit. Actual Garmin G1000 avionics package - a fully integrated avionics system. Garmin Prodigy for Phenom. Sun Airlines has not spotted any other Phenom 300 simulators and Phenom 300 simulators for Microsoft Flight Simulator X (FS10) or X-Plane. Also note that the Embraer Phenom 300 Simulator is also known as the E55P Simulator, Embraer 300 Simulator, Phenom 300 Simulator and the EMB-505 Simulator.